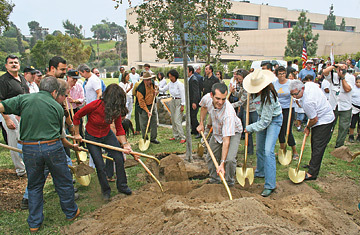 Digging in Los Angeles in 2006 kicked off its campaign to plant 11 million trees over the next 30 years. If trees fall in the middle of a city, does anyone make a sound? So far, not much of one--and that's a problem. To most of us, city trees are to genuine forests what gardens are to jungles or fish tanks are to the ocean--pocket-size imitations of the wild world, decorative perhaps but playing no real role in the global ecosystem. But urban trees are a lot more important than that, and at the moment, they're in decline. The broad-shouldered maple you pass without notice on your way to the office each day is part of a sprawling urban canopy that helps absorb carbon dioxide, pull particulate matter from the air, prevent floods and keep temperatures at livable levels. How much tree cover a city needs depends on local climate, but in the U.S., the guidelines divide roughly along the Mississippi River, with cities to the east needing a 40% cover and cities to the west a less leafy 25%. These days things aren't nearly that green. Tree cover from city to city has been measured by any number of studies, so direct comparisons of figures are hard, but across the country, things are trending downward. In the past few decades, Washington has lost half its tree cover; San Diego's is off about a quarter; the cover in cities in Michigan, North Carolina and Florida has fallen to about 27% of what it once was; Chicago and Philadelphia are just 16%. "Urban deforestation," says Ed Macie, an urban specialist with the U.S. Forest Service in Atlanta, "compares with what's going on in the world's rain forests." As with so many other environmental problems, there are a lot of things causing the tree trouble. In the mid to late 20th century, Dutch elm disease wiped out millions of city trees, and now bark beetles, gypsy moths and emerald ash borers are chomping through millions more, thanks in part to climate change that makes cities more hospitable to the pests. The fact that so many trees exist in cities to be eaten in the first place is a tribute to our greener impulses. Many municipalities planted their now towering canopies right after World War II, but age is taking a toll as a lot of those trees simply reach the end of their life span. Development too is a problem. In and around cities, single-family homes that once covered only a portion of their lot are being replaced by McMansions that don't leave enough yard space to support large-canopied trees. Sprawl is causing the footprints of cities themselves to increase, with what was once relatively lush land being bulldozed and paved over. Says Macie: "Some regions have been urbanizing at a pace of over 50 forested acres a day, 365 days a year for over 20 years. That's a pretty big deal." Urban fiscal woes have had a hand as well. Cities unable to keep up with the maintenance of large roadside trees swap them for pygmy-statured hawthorns and crape myrtles. Newly designed parks are replacing trees with no-fuss tennis courts and playgrounds. "Budgets are tight, and no one is giving extra money to plant larger trees," says Greg McPherson, director of the U.S. Forest Service Center for Urban Forest Research. All this hits the environment hard, starting with air quality. Every tree that's subtracted from a city's ecosystem means some particulate pollution that should have been filtered out remains. In Washington, that amounts to 540 extra tons each year. Simply replanting does not suffice because small, young trees require decades to grow to full size. "A big tree does 60 to 70 times the pollution removal of a small tree," says David Nowak, a project leader with the U.S. Forest Service's Northern Research Station in Syracuse, N.Y. The crown of a large tree is also a freestanding antiflood reservoir, in some cases intercepting so much rainfall that more than 1,500 gal. a year evaporates instead of hitting the ground. Chop down the tree, and you increase the volume of storm water a city must manage--something that affects older cities with aging drainage systems especially severely. But it's the thermometer that most noticeably reflects the loss of trees. A high canopy prevents sunlight and heat from ever reaching the ground; by contrast, unshaded asphalt soaks up thermal energy and radiates it back, creating what is known as heat islands. In Atlanta, where developers bulldozed 380,000 acres from 1973 to 1999--much of it heavily forested--temperatures have climbed 5º to 8º higher than in the surrounding countryside, according to NASA, which studies global hydrology and climate. Scientists fear the heavily developed corridor between Boston and Washington could be the next big hot zone. Local governments are finally responding to the problem. More than 2,000 big and small cities have launched long-term planting and preservation programs. In San Francisco, new laws treat mature trees like historic buildings. Los Angeles, whose plans are perhaps the most ambitious, is looking to plant 1 million trees over the next 30 years, though of course the effects would not be felt for a long time. Already 100,000 of those trees are in the ground, most of which should grow to have canopies 40 feet across. Boston, New York City and San Diego all have plans of their own.